Gold Leaf is pure gold that has been beaten down and hammered out into very thin sheets. The leaves can then be cut into squares of about 10 square inches. Gold leaf should assay at about 22 carats. The colour of the gold differs according to the origin and the amount of alloy used. The art of gilding is of ancient origin and was and still is used to embellish domes, vaults and ceilings of buildings and to decorate furniture and frames. Gilding is the application of gold leaf to a prepared, firm surface. 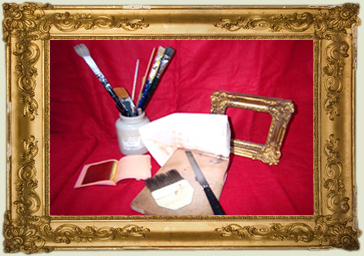 There are many types of gilding, but oil gilding and water gilding are what Jane Williams Gilding specialises in. Water gilding involves a gesso prepared surface, with a coloured clay on top - all of which has been mixed with rabbit skin glue and water. 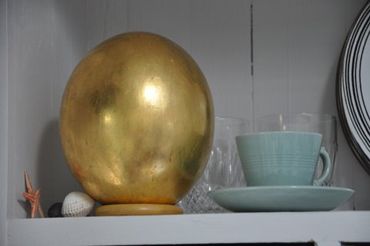 The gesso is then sanded to the smoothness of porcelain, the clay is then layered on to the gesso and finally the gold leaf is applied with a rabbit skin size and squirrel hair brush burnished if a lustrous finish is required.This technique is applied to frames, furniture and to great effect on ostrich eggs. Oil gilding is mostly applied to ceilings corbels and rosettes, gates, railings - any outdoor surface. The preparation is not as intricate as water gilding, but the surface must be as smooth and clean as possible. The leaf is applied with an oil-based glue - again the finish can be either matte or highly burnished. Some examples of Jane's oil gilding work can be seen on the cross of the Minot Tower of St Patricks cathedral, each of the four clock faces of Temple Street Church, gates and railings of Powerscourt gardens in Co.Wicklow and extensive work carried out on the ceiling of the Dome in City Hall. Antiquing is the distressing of a finished gilded piece, there are many different ways of doing this - however, it is mostly done when restoration requires for example the corner of a restored mirror to match the original gilt or when restoring furniture.